We’re still basking in above average weather. 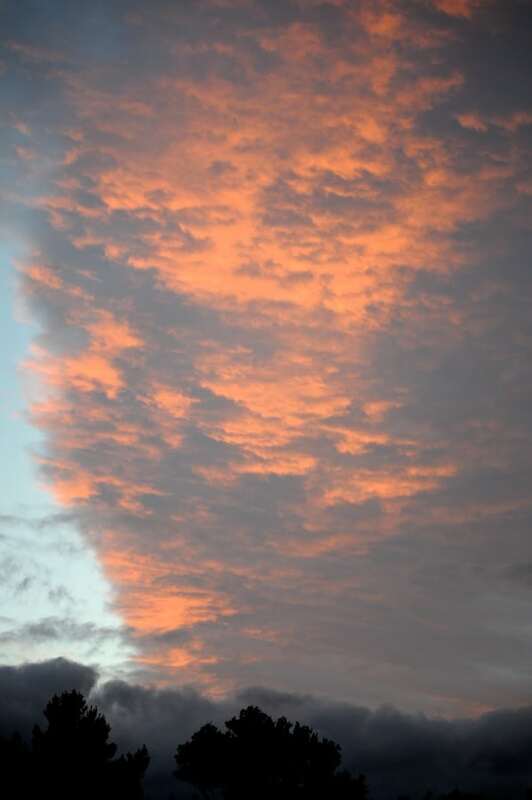 It was a fiery start to this morning. It was almost like flames shooting from behind the Tararuas. This colourful start to the day was just what I needed. Having been running on adrenalin and coffee for most of the week, my batteries have finally run out of juice. Thank goodness the weekend is here. Lots planned in the kitchen. Also, have a master plan to scupper the antics of the roof rodents that have been giving us sleepless nights. Best of all I’ve plans for wearing out the bassets who have missed out a few miles of walking whilst I’ve been earning money to keep them in the lifestyle they’ve become accustomed to. I just love weekends. Shame we only have one a week. Don’t be fooled his cute wrinkled ankles. This is a basset who went deep paddling beyond his usual depth and all because he spied ducks on the other side of the river. You’ve got to love his enthusiasm even if he does almost give me heart palpitations worrying how my non swimming basset might survive if he really was out of his depth or worst still swept away in a strong current. You can be sure Little basset wouldn’t leap to save him, he’s no water baby either. 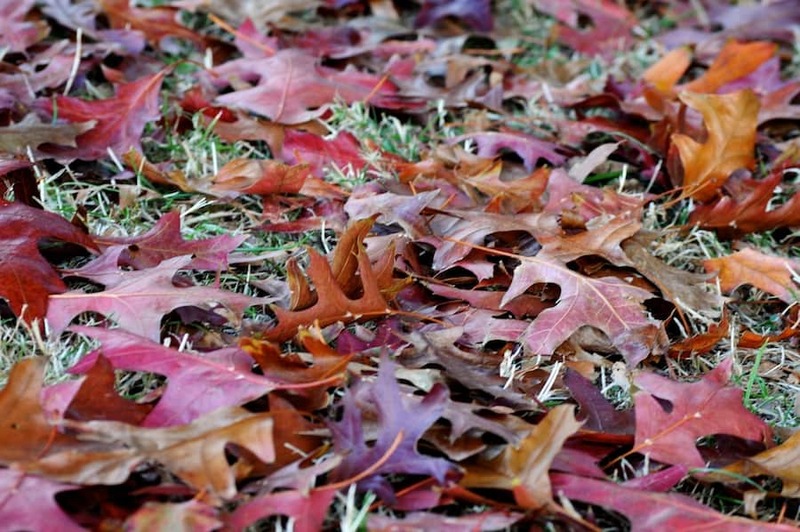 It’s hard to resist the temptation to kick your way through the piles of autumnal leaves. They are now a colourful blanket all around us. 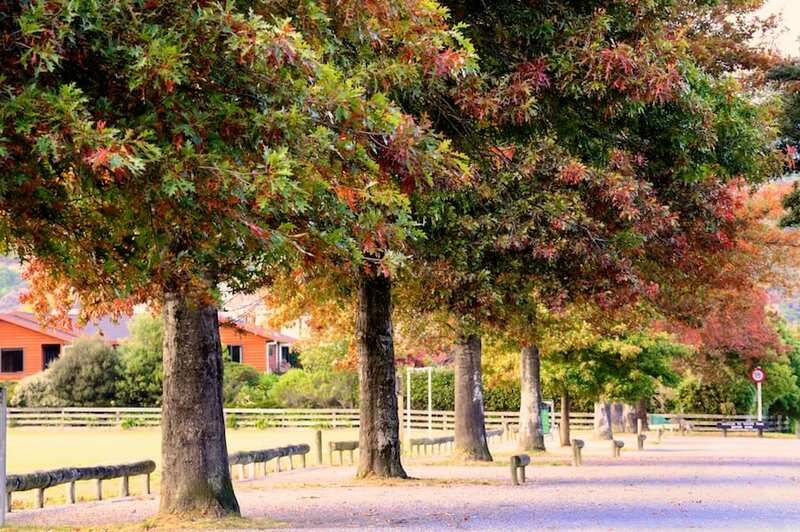 The extreme dry weather this year has deepened the colours even if it hasn’t stopped the leaves falling. With bright sunshine during the day this is one of the best autumn we’ve had in the four years we’ve been in New Zealand. As well as bright days the night skies are amazingly clear and stars burn bright bringing a twinkling light in every direction. All in all a visual cacophony. Memories of harvest festival services in church when I was a child have been popping in my head recently. Displays of fruits and vegetables in technicolour glory all laid out in church to celebrate the end of summer’s hard work. I was never in favour of tinned produce making it into the display when those who didn’t grow their own still wanted to make a charitable donation to the festival. The wonder for me was seeing people’s hard labour on display, grown with love and offered with good heart. Popping in a tin of peaches and pears just didn’t cut it for me. It’s been a veritable seasonal feast here are Domestic Executive HQ. The kitchen garden has been burgeoning with crops and the kitchen overflowing with new adventures to capture this seasons produce in chutneys. I do however have some regret as things in the garden look so wonderfully lush and in their rightful place. 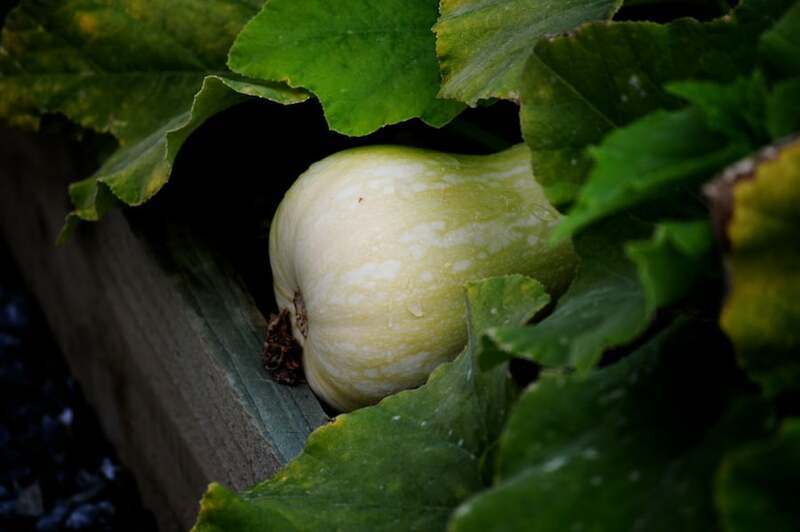 Just like this butternut squash peaking out from under the leaves. Setting aside the debris, layabout hose and impromptu fencing in the kitchen garden I am excited about what’s happening in there. Stuff is growing. Stuff we can eat. Stuff that hasn’t gone to seed, rotted or been eaten away by pests. It’s all short of a miracle given the very limited time I spend tending it. I’ll do a full blog update on how my first growing season has faired soon. I promise. This weekend more than most feels like a blessed relief. The redundancy threat in our household has been lifted which is very good news for us but we are ever conscious that there are people who have not been so lucky. My ideal work life balance has gone slightly array in recent weeks but with winter on the way I’m OK with that. 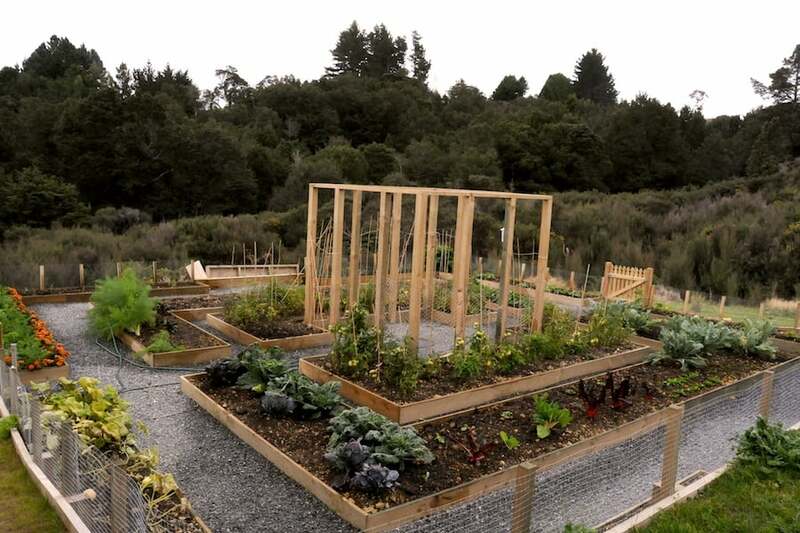 I am however planning to redress the balance come spring when I will most certainly be having to spend a great deal more time down in the kitchen garden if we are to fulfill my backyard pantry dreams. Election fever in the UK called for something rather English today. Quite by chance election day coincided with a special Afternoon Tea with some rather special friends from Wellington. It was such a pleasure to put on a spread for people – we rather overdosed on my favourite bakes. 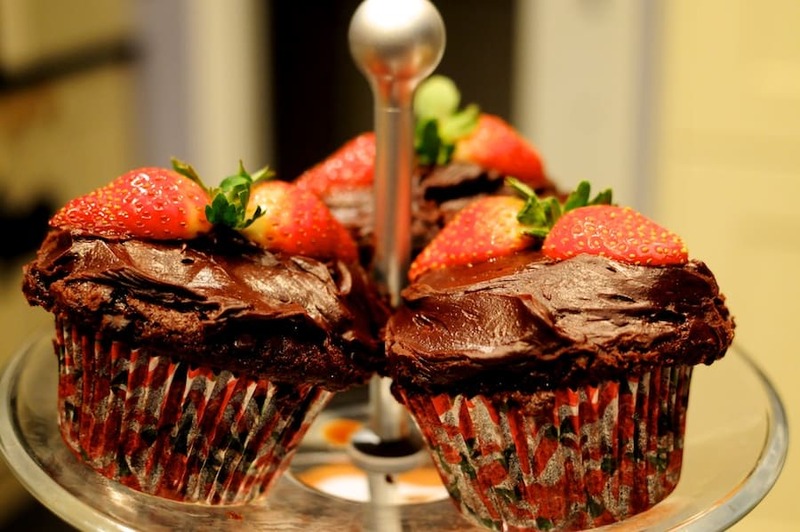 My tried and tested Rhubarb and Custard Cake and Fat Rascals came into their own but as a new adventure I made some rather decadent chocolate cupcakes using my Ottolenghi Cookbook. I added a late summer flourish strawberry which grabbed by attention at the supermarket today. Recipes from Ottolenghi look ravishing but on closer scrutiny they are rather cumbersome for a plain, simply and easy cook like me. I am however now convinced that the extra effort is worthwhile. Watch out I may be branching out to new pastures which is rather more than British politics right now. Seeing the trees turn colour this autumn gives me mixed feelings. I like the technicolour effect but hate the thought we’re heading into winter. It’s mighty cold morning and night although the sun is still shining bright to keeping us warm outside. I have high hopes for the weekend which is due to bring us sunshine as there is lots of autumn clearing up to be doing outside. Not to mention a wood store to be built. In the hours before the rain and wind arrived at the weekend, the bassets and I enjoyed some wonderful autumnal sun. But walking through the bush it was like a game of cat and mouse as I was desperately trying to capture the bassets as they passed through a sunny spot. 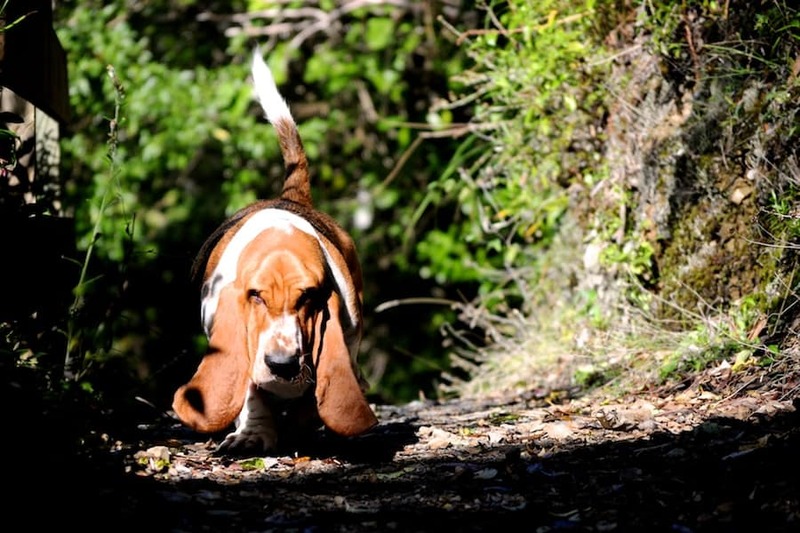 I can’t quite work out whether Little Basset is scowling at me in this picture or it’s just his face of determination as he plods his way up the hill. 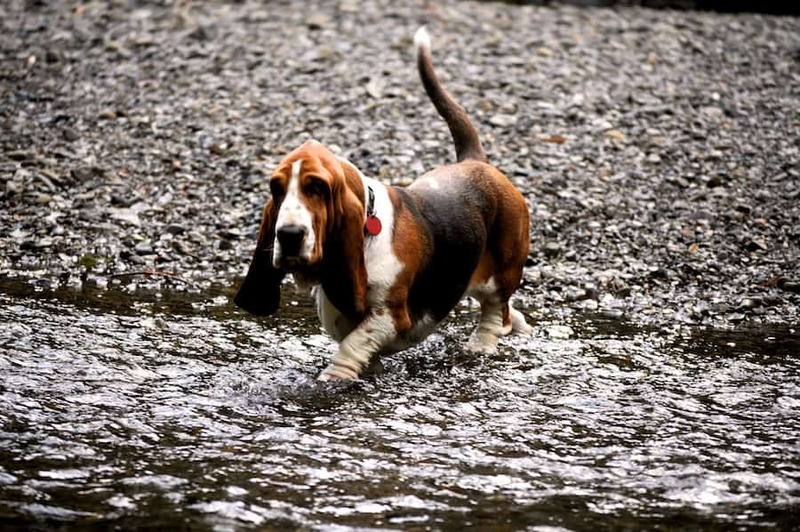 Beneath the serious face though, this determined little basset was enjoying his walk – you can tell by his upright tail. You’ve got to admire these toadstools. A small matter of a gravel path wasn’t going to stop them from doing what they wanted. To grow and do there thing during the short window of time that they have for life. 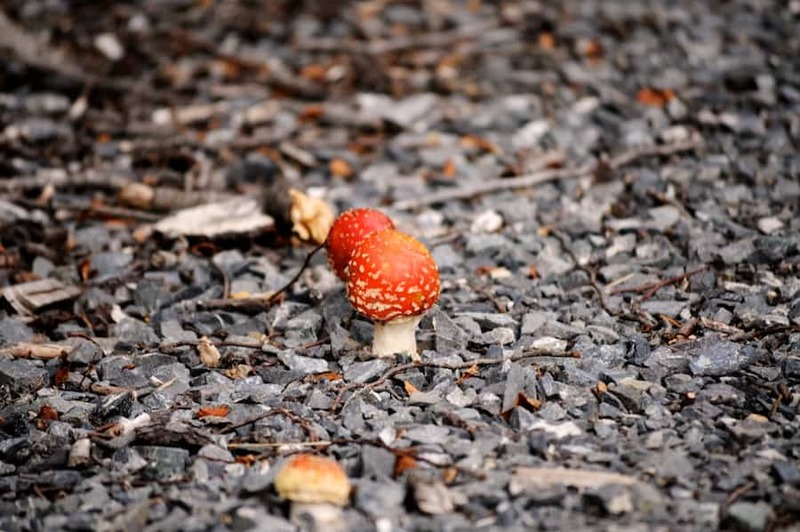 By the time I’d returned back along this path after our basset romp these toadstools were squashed flat. Such a shame after all the effort that they put into pushing their way through the path. There is little better than being able to let the bassets roam off lead. It doesn’t happen often for fear of mowing down small children, terrorising picnickers or high tailing off on an attractive scent trail. I prefer to let the hounds cross the swing bridge at their own pace off lead as that way I can admire their ears and tails in motion from a better vantage point. 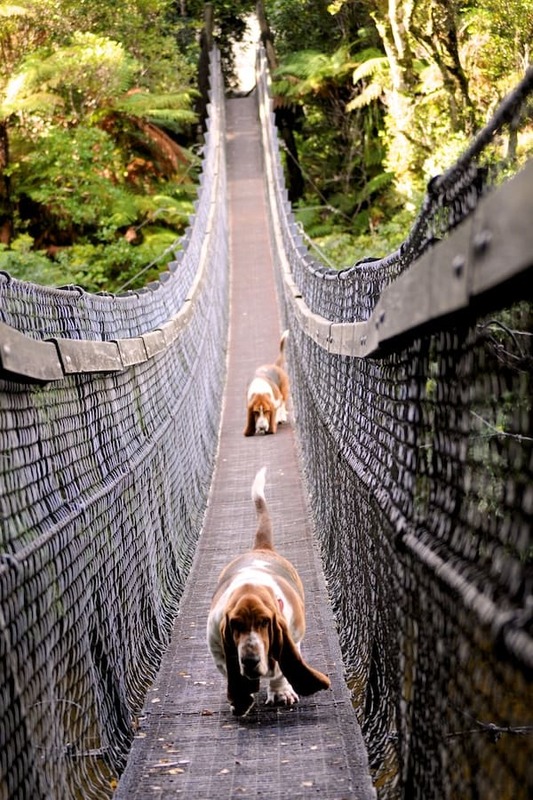 We missed our walk around the regional park for over 6 months whilst they infested the place with 1080 poison, Now its back open we can’t get enough of the wonderful trails, views of the river and the sniffing opportunities for bassets are the best around.